Shipping and Returns! If you don’t love it, pay no return shipping or restocking fees for online orders. Learn more. We’re sorry. We couldn’t complete your trade-in at this time. Continue to complete your order. After checking out, you’ll receive info to help you with your trade-in. You’re not done with your old device yet. Trade it in for an AT&T Promotion Card—good for AT&T products and services. Your trade-in information will be submitted along with your order. Are you sure you want to remove your device trade-in? When you pick up your device in the store, you can exchange your old device for an AT&T Promotion Card—good for AT&T products and services. Not interested? We’ll send you a mailer just in case you change your mind. It’s easy to complete your trade-in online. We’ll send your prepaid shipping supplies in 5 to 7 days. Pack and ship your device to receive your AT&T Promotion Card—good for AT&T products and services. Your trade-in info will be submitted along with your order. Learn how to get a Moto G6 for free. See offer details. The moto g play 6th Gen has the features and energy you need to keep going. With the long-lasting1 4000mAh battery and a 5.7" HD+ Max Vision display, you'll enjoy edge-to-edge entertainment. Watch your entertainment come alive on the edge-to-edge screen. Never miss a great shot with a camera that focuses as fast as you do. Unlock your phone with just a touch. moto g6 play Offer: Limited time. Select locations. Requires new line. Not an upgrade offer. Elig. 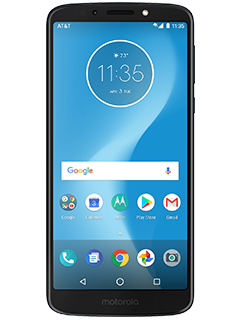 Devices: Buy moto g6 play ($179.99) on 0% APR AT&T Next (30-mo. at $6.00/mo.) or AT&T Next Every Year (24-mo. at $7.50/mo.). Business customers w/a qual. wireless svc agmt ("Business Agmt") for Corporate Responsibility User lines of svc. can also buy on Equipment Installment Plan (24-mo. at $7.50/mo. or 36-mo. at $5.00/mo.). $0 down for well-qualified credit or down payment may be req'd. Retail price is divided into monthly installments. Tax on full retail price due at sale. After all credits, get moto g6 play for free. Req'd Wireless: Postpaid wireless voice & data service (For consumers: min. $50/mo. for new svc with autopay and paperless bill discount. Pay $60/mo. until discount starts w/in 2 bills. For business customers: min. $50/mo. on AT&T Mobile Share Plus for Business plan for new svc with AutoPay discount; pay min. $60/mo. until discount starts w/in 2 bills. For both: Other qual. plans available. Existing customers can add to elig. current plans.). If you cancel wireless svc, will owe device balance of up to $180. Activation Fee: $30. Return: Return w/in 14 days (w/in 30 days for business customers). Restocking fee up to $45 may apply. Bill Credits: Credits start w/in 3 bills. Applied monthly in equal amounts to device over entire agmt term & will not exceed $180. Wireless line must be active & in good standing for 30 days to qualify. To get all credits, wireless line must remain active, with eligible service, and on agmt for entire term. If you cancel service, upgrade or pay up/off agmt early your credits may cease. Limits: May not be combinable w/other offers, discounts or credits. Purchase, financing & other limits & restr's apply. Participation in this offer may make your wireless account ineligible for select other offers (including select bill credit offers) for a 12 month period. See store for offer details. GEN. WIRELESS SVC: Subj. to Wireless Customer Agmt (att.com/wca) or to applicable Business Agmt for business customers. Credit approval required. Svcs not for resale. Deposit: May apply. Limits: Purch. & line limits apply. Prices may vary by location. Taxes, fees, monthly, other charges, usage, speed, coverage & other restr's apply per line. See att.com/additionalcharges for details on fees & charges. Promotions, terms & restr's subject to change & may be modified or terminated at any time without notice. International and domestic off-net data may be at 2G speeds. AT&T service is subject to AT&T network management policies. See att.com/broadbandinfo for details.